Anticipation ran high at Harker’s lower school on Oct. 4 when, just before noon, the grade 3 class assembled on the blacktop eagerly watching for the yellow bus from the upper school to appear, heralding the arrival of their sophomore Eagle Buddies. Holding signs indicative of their homerooms so that their older buddies could find them, the third graders excitedly chanted “Eagle Buddies!” as the bus finally pulled to a stop in front of the Bucknall campus. Prior to meeting at the lower school, the buddies had corresponded with letters and pictures, but this event marked the first time they met in person. The buddies will follow one another and continue to bond over the course of the next several years in the successful mentoring program. Alumna Robichaud, who is also a Harker parent (Jonathan Schwartz, grade 8; Kurt Schwartz, grade 9), noted that she first started working at Harker “fresh out of college” and recalled having taught some of the sophomore buddies when they were younger. After the buddies united with one another, they listened to welcoming remarks from Ken Allen, the lower school’s dean of students. Then all the students ate lunch together on the main field and were free to play sports or work on craft tables located at the edges of the turf. 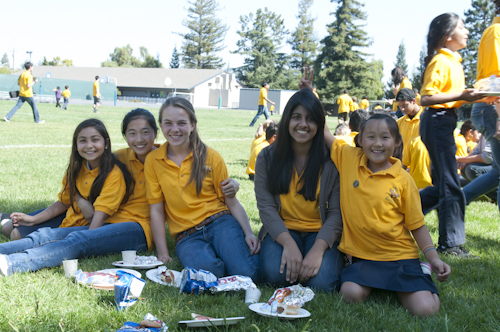 Enjoying their hot dog lunch with their new younger buddy, Brooklyn Cicero, sophomores Ankita Pannu and Shannon Su called the Eagle Buddies program a great way to allow younger kids to get to know older students. “We had a lot of fun looking for Brooklyn when we got off the bus, we were so excited to see each other in real life!” said Su, recalling how Cicero had previously introduced herself and stated her interests in her letter. An excited Cicero agreed, adding that she also enjoyed playing tetherball with her new older friends. Following closing remarks on the main field, all the buddies said goodbye and the sophomores returned to the upper school campus. Upcoming Eagle Buddies events for these two grades include a pajama day, service project and book drive. They will also continue to correspond via Thanksgiving, Valentine’s Day and St. Patrick’s Day cards.